We have here every Thursday vegetable market,where we get fresh veggies.Most of the people here opt for this market once a week.One day i noticed a guy selling corn in the non season.Then i went and asked him,he said it is sweet corn and it priced at rs.10/- per cob which is quite high compared to normal corn which is seasonal and which would cost less than Rs.5/-. In the same water pressure cook carrot,beans and cabbage.Strain water and keep aside. Take 2 tbsp of boiled corn and grind it into smooth paste. Put a big vessel on the flame.Add butter.When butter melts add the water in which the veggies are cooked. Let it come to a boil.Then add all the veggies and corn. Then add the mashed corn and mix throughly.Again boil for 2-3 minutes. Now add corn flour mixed in water and stir continuously so that no lumps are formed. h any starters of your choice. 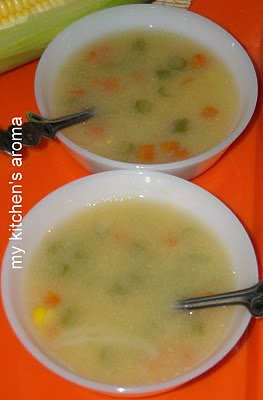 Very comforting bowl of filling soup.. Delicious soup. Perfect to have in this cold season. 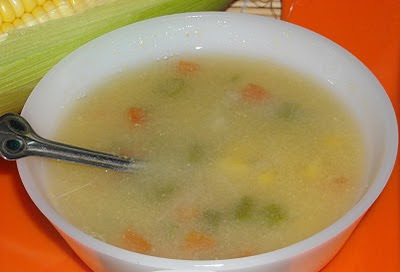 very tempting soup...would try it soon..
lovely refreshing and healthy soup.you have a nice blog and u can visit my blog and give ur valuable comments. 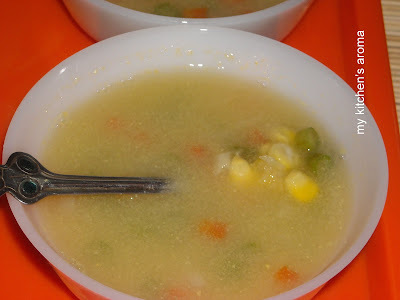 Sweet corn soup would be a default when I visited restaurants back in india. Looks creamy and delicious.